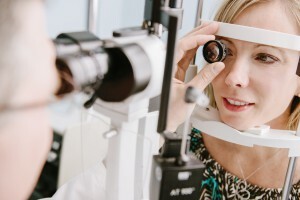 A routine eye exam will allow the doctor to evaluate for signs of possible glaucoma. If there are concerning findings during your exam, or if you have a strong family history of glaucoma, this may indicate the need for further examination. In order to diagnose glaucoma, our doctors may perform several tests. These tests will determine if you have glaucoma and how advanced it may be. If it is determined that you do not have glaucoma, the doctor may tell you that you are a “glaucoma suspect” and recommend annual or semi-annual examinations. Tonometry– During this simple and painless test, the intraocular pressure of your eye is measured. Eye drops are first used to numb your eye. A tonometer is then placed against your eye to measure the pressure in the eye. Pachymetry– The thickness of the cornea can affect the pressure reading in the eye—a thin cornea may increase your risk for glaucoma. Also, a thinner cornea may correlate to a higher than measured intraocular pressure. Eye drops are first used to numb your eye. The pachymeter is then positioned against your cornea to measure its thickness. Gonioscopy– This painless test is used to see if the angle between the iris and cornea is open or closed, which will help determine the type of glaucoma. Numbing drops are first applied to your eye and then the gonioprism is placed against your eye so the doctor can properly view the angle anatomy. Visual Field Test– This test looks at your field of vision. Each eye is done individually. You will sit at a machine, look straight ahead at a computer screen, and press a button every time you see a light pass by. The machine will plot out your visual field, indicating any potential bad spots where vision may have been lost. This test will be repeated over time to monitor for any changes. Imaging Studies– These tests, such as Optical Coherence Tomography (OCT), Heidelberg Retinal Tomography (HRT), and Fundus Photography, utilize the most advanced technology to evaluate the optic nerve. They are done on initial evaluation, and then in conjunction with your routine follow-up exams to monitor for any signs of progression or further deterioration of your glaucoma.